I wish more German Pinot Noir (Spätburgunder) would come to Australia. But it doesn’t. We get the odd sniff – a wine here and there – but little more. That’s why it was bloody exciting to try some of these wines from Bernard Huber last week. 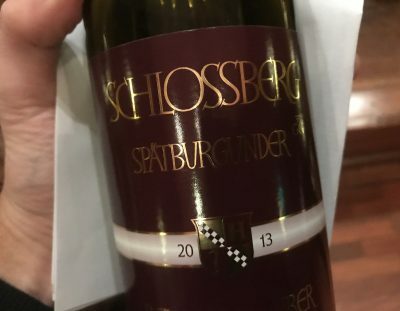 This is an estate that sits right up at the pointy end of German Spätburgunder, with winemaker Bernard Huber referred to by Michael Schmidt (part of Jancis Robinson’s team) as ‘the wizard of German Pinot Noir’. 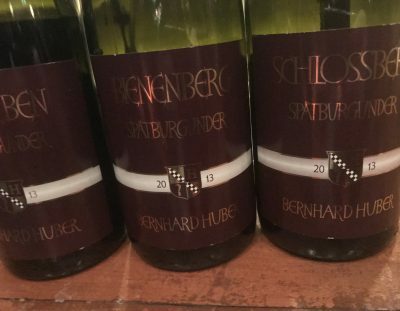 Sadly, Bernard Huber passed in 2014, making these 2013 wines his final release (though winemaking duties have been taken over by his son Julian Huber). The home of Weingut Bernard Huber is Malterdingen, in Baden on the edge of the Black Forest. Baden receives some of the most sunshine hours of anywhere in Germany, and has a winemaking history – and a Pinot Noir history – that dates back 700 years to the Cistercian monks. In fact, Malterdingen is a synonym for Pinot Noir in southern Germany, such is the Pinot context here. The limestone soils just punctuate the equation, too. That said, the winemaking here is not quite Burgundian. Long oak ageing (in typically newer barrels) and extremely late picking is the norm here, the style more international than a Burgundy mimic, with the acidity and firm edge that a somewhat marginal climate delivers. The other secret here is yields that can only be described as Grand Cru Burgundy-esque. Ultra-low yields don’t always deliver glory (sometimes it just makes hard wines), but when combined with ideal vineyard sites the result is supremely concentrated wines that, in my opinion, are just as good (though very different) as Burgundy’s finest. Then again, why compare these wines to Burgundy at all? These are different – and seriously high quality – Pinot Noir expressions. Apparently there is even a tier of quality above these wines too. Jeebus. Notes are as written on the day (last week). RRP is approximate. Extra bits in italics. Bernard Huber is distributed in Australia by Cellarhand. From young vines (6-12 years old). Yield 65hl/ha. 14 months in older oak. Broad cherry flavours with a dash of undergrowth. There’s fruit through the middle but it tightens up through the vaguely ungenerous finish. That glacé red fruit juicy middle though makes this plump and fun, and contrasts nicely with the firm acidity to finish. Quality, though feels rather more cool climate in this lineup. Best drinking: 2017-2021. 17.5/20, 91/100. $53. Would I buy it? I’d go for the more premium wines. From vines up to 40yrs old. 37hl/ha yield. 18 months in barrel (12 months in new oak). Has dominant whole bunch (40%) on the nose, but it doesn’t derail the palate. The balance here is exceptional, there’s a sense of ‘just enough’ acidity and the power through the middle is real top tier. Excellent tannin grip too. You can’t shake the sense of winemaking on the edge, of grapes picked late because if they weren’t this wouldn’t be anywhere near as concentrated. Maybe a fraction bitter? Wow this is impressive in its depth, you’d even call it burly. A burly German Pinot! Impressive. Eats up the new oak too. The breadth here is almost Martinborough-esque, but in a different, cooler form. Wow. Best drinking: 2019-2027. 18.5/20, 94/100+. $105. Would I buy it? Oh heck yes! From fossil rich limestone soils. Vines 40-53yrs old. 30hl/ha yield. Smokier, more spice and more expression here. Lots of whole bunch. Silky texture belies just how much whole bunch, in fact. Beautiful pure, pushed to perfect ripeness fruit, no herbs, burly tannins yet still pure silk. Grand Cru Burgundy level concentration. Just a little intrusion from acidity. But gee it shapes the wine. It’s almost too concentrated though, dry and super long. Tangy acidity. But there is this lovely lusciousness too through the middle. Yet no glycerol fatness – it’s still a stern wine. A bloody excellent, powerhouse red! A Pinot of swagger but also acidity. A paradox, even. Stunning. Best drinking: 2017-2030. 18.7/20, 95/100. $144. Would I buy it? Absolutely. GC Burgundy quality, just not the price. Comes off a slope that has had vines for almost 500 years that reaches a gradient of 72%! Yields are 28hl/ha. 35yr old vines. This is the most luscious of all the wines here. You’d almost not expect it to be from Germany. Blackberry and the heavy edge of mainly whole bunches. I find the whole bunches just a little intrusive here. Gee the concentration here is wild though! Severe, even. There is less of the acid intrusion on the finish here but it’s still a wild, stemmy and firmly tannic ride. Hard to express just how complex this wine is, even if it is not an easy wine. I prefer the more forthright lusciousness of the Bienenberg as it’s just a bit too firm. In time, however, this may be the better wine. Best drinking: 2019-2032. 18.5/20, 94/100+. $180. Would I buy it? I’d take this for later and the Bienenberg now, thanks.